Home Free Cookies Winner Announced! 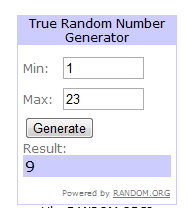 And the winner is #9, Andrea Van Sickle! Andrea, please send your mailing address to realfoodallergyfree@gmail.com. I’ll pass your info on to Home Free. You can read my review of allergy-free cookies by Home Free here.